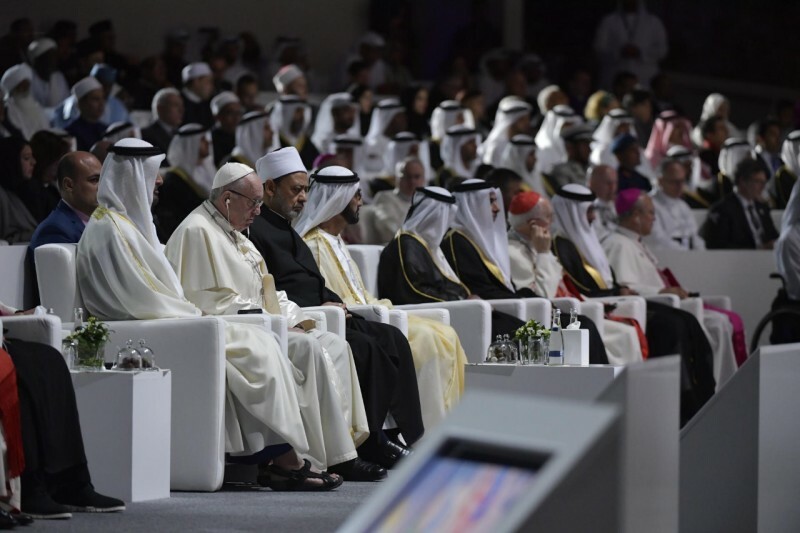 Pope Francis on February 4, 2019, addressed the Interfaith Meeting at the Founder’s Memorial in Abu Dhabi. Following is the Vatican-provided text of his address. As-salāmu alaykum! Peace be with you! I give heartfelt thanks to His Highness Sheikh Mohammed bin Zayed Al Nahyan and Doctor Ahmad Al-Tayyib, Grand Imam of Al-Azhar, for their words. I am grateful to the Council of Elders for the meeting that we have just had at the Grand Mosque of Sheikh Zayed. I cordially greet the civil and religious authorities and the Diplomatic Corps. Allow me also to thank you sincerely for the warm welcome that you all have given to me and our delegation. I also thank all those who have contributed to making this journey possible and who have worked with dedication, enthusiasm, and professionalism towards this event: the organizers, those in the Protocol Office, the security personnel, and all who have made their contribution in various ways “behind the scenes”. A special word of thanks also to Mr. Mohamed Abdel Salam, former Adviser to the Grand Imam. With a heart grateful to the Lord, in this eighth centenary of the meeting between Saint Francis of Assisi and Sultan al-Malik al Kāmil, I have welcomed the opportunity to come here as a believer thirsting for peace, as a brother seeking peace with the brethren. We are here to desire peace, to promote peace, to be instruments of peace. The logo of this journey depicts a dove with an olive branch. It is an image that recalls the story – present in different religious traditions – of the primordial flood. According to the biblical account, in order to preserve humanity from destruction, God asked Noah to enter the ark along with his family. Today, we too in the name of God, in order to safeguard peace, need to enter together as one family into an ark which can sail the stormy seas of the world: the ark of fraternity. The point of departure is the recognition that God is at the origin of the one human family. He who is the Creator of all things and of all persons wants us to live as brothers and sisters, dwelling in the common home of creation which he has given us. Fraternity is established here at the roots of our common humanity, as “a vocation contained in God’s plan of creation”. This tells us that all persons have equal dignity and that no one can be a master or slave of others. We cannot honor the Creator without cherishing the sacredness of every person and of every human life: each person is equally precious in the eyes of God, who does not look upon the human family with a preferential gaze that excludes, but with a benevolent gaze that includes. Thus, to recognize the same rights for every human being is to glorify the name of God on earth. In the name of God the Creator, therefore, every form of violence must be condemned without hesitation, because we gravely profane God’s name when we use it to justify hatred and violence against a brother or sister. No violence can be justified in the name of religion. I wish to express appreciation for the commitment of this nation to tolerating and guaranteeing freedom of worship, to confronting extremism and hatred. Even as the fundamental freedom to profess one’s own beliefs is promoted – this freedom being an intrinsic requirement for a human being’s self-realization – we need to be vigilant lest religion be instrumentalized and deny itself by allowing violence and terrorism. Fraternity certainly “also embraces variety and differences between brothers and sisters, even though they are linked by birth and are of the same nature and dignity”. Religious plurality is an expression of this; in such a context the right attitude is neither a forced uniformity nor a conciliatory syncretism. What we are called to do as believers is to commit ourselves to the equal dignity of all, in the name of the Merciful One who created us and in whose name the reconciliation of conflicts and fraternity in diversity must be sought. Here I want to reaffirm the conviction of the Catholic Church: “We cannot truly call on God, the Father of all if we refuse to treat in a brotherly way any man, created as he is in the image of God”. Various questions, however, confront us: how do we look after each other in the one human family? How do we nourish a fraternity which is not theoretical but translates into authentic fraternity? How can the inclusion of the other prevail over exclusion in the name of belonging to one’s own group? How, in short, can religions be channels of fraternity rather than barriers of separation? If we believe in the existence of the human family, it follows that it must, as such, be looked after. As in every family, this happens above all through a daily and effective dialogue. This presupposes having one’s own identity, not to be foregone to please the other person. But at the same time, it demands the courage of otherness, which involves the full recognition of the other and his or her freedom, and the consequent commitment to exert myself so that the other person’s fundamental rights are always affirmed, everywhere and by everyone. Without freedom, we are no longer children of the human family, but slaves. As part of such freedom, I would like to emphasize religious freedom. It is not limited only to freedom of worship but sees in the other truly a brother or sister, a child of my own humanity whom God leaves free and whom, therefore, no human institution can coerce, not even in God’s name. The courage of otherness is the heart of dialogue, which is based on sincerity of intentions. Dialogue is indeed compromised by pretense, which increases distance and suspicion: we cannot proclaim fraternity and then act in the opposite way. According to a modern author, “The man who lies to himself and listens to his own lie comes to such a pass that he cannot distinguish the truth within him, or around him, and so loses all respect for himself and for others”. In all this, prayer is essential: while sincerely intended prayer incarnates the courage of otherness in regard to God, it also purifies the heart from turning in on itself. Prayer of the heart restores fraternity. Consequently, “as for the future of interreligious dialogue, the first thing we have to do is pray, and pray for one another: we are brothers and sisters! Without the Lord, nothing is possible; with him, everything becomes so! May our prayer – each one according to his or her own tradition – adhere fully to the will of God, who wants all men and women to recognize they are brothers and sisters and live as such, forming the great human family in the harmony of diversity”. There is no alternative: we will either build the future together or there will not be a future. Religions, in particular, cannot renounce the urgent task of building bridges between peoples and cultures. The time has come when religions should more actively exert themselves, with courage and audacity, and without pretense, to help the human family deepen the capacity for reconciliation, the vision of hope and the concrete paths of peace. Let us return, then, to the initial image of the dove of peace. Peace, in order to fly, needs wings that uphold it: the wings of education and justice. Education – in Latin it means “extracting, drawing out” – is to bring to light the precious resources of the soul. It is comforting to note how in this country investments are being made not only in the extraction of the earth’s resources but also in those of the heart, in the education of young people. It is a commitment that I hope will continue and spread elsewhere. Education also happens in a relationship, in reciprocity. Alongside the famous ancient maxim “know yourself”, we must uphold “know your brother or sister”: their history, their culture and their faith, because there is no genuine self-knowledge without the other. As human beings, and even more so as brothers and sisters, let us remind each other that nothing of what is human can remain foreign to us. It is important for the future to form open identities capable of overcoming the temptation to turn in on oneself and become rigid. Investing in culture encourages a decrease of hatred and a growth of civility and prosperity. Education and violence are inversely proportional. Catholic schools – well appreciated in this country and in the region – promote such education on behalf of peace and reciprocal knowledge in order to prevent violence. Young people, who are often surrounded by negative messages and fake news, need to learn not to surrender to the seductions of materialism, hatred, and prejudice. They need to learn to object to injustice and also to the painful experiences of the past. They need to learn to defend the rights of others with the same energy with which they defend their own rights. One day, they will be the ones to judge us. They will judge us well if we have given them a solid foundation for creating new encounters of civility. They will judge us poorly if we have left them only mirages and the empty prospect of harmful conflicts of incivility. Justice is the second wing of peace, which often is not compromised by single episodes, but is slowly eaten away by the cancer of injustice. No one, therefore, can believe in God and not seek to live in justice with everyone, according to the Golden Rule: “So whatever you wish that men would do to you, do so to them; for this is the law and the prophets” (Mt 7:12). Peace and justice are inseparable! The prophet Isaiah says: “And the effect of righteousness will be peace” (32:17). Peace dies when it is divorced from justice, but justice is false if it is not universal. A justice addressed only to family members, compatriots, believers of the same faith is a limping justice; it is a disguised injustice! The world’s religions also have the task of reminding us that greed for profit renders the heart lifeless and that the laws of the current market, demanding everything immediately, do not benefit encounter, dialogue, family – essential dimensions of life that need time and patience. Religions should be the voice of the least, who are not statistics but brothers and sisters, and should stand on the side of the poor. They should keep watch as sentinels of fraternity in the night of conflict. They should be vigilant warnings to humanity not to close our eyes in the face of injustice and never to resign ourselves to the many tragedies in the world. Having spoken of fraternity as an ark of peace, I now want to take inspiration from a second image, that of the desert which surrounds us. Here, in just a few years, with farsightedness and wisdom, the desert has been transformed into a prosperous and hospitable place. From being an unapproachable and inaccessible obstacle, the desert has become a meeting place between cultures and religions. Here the desert has flourished, not just for a few days in the year, but for many years to come. This country, in which sand and skyscrapers meet, continues to be an important crossroads between the West and East, between the North and South of the planet: a place of development, where once inhospitable spaces supply jobs for people of various nations. Nonetheless, development, too, has its adversaries. If the enemy of fraternity is the individualism referred to above, I want to point to indifference as an obstacle to development, an indifference which ends up converting flourishing realities into desert lands. In fact, a purely utilitarian development cannot provide real and lasting progress. Only an integral and cohesive development provides a future worthy of the human person. Indifference prevents us from seeing the human community beyond its earnings and our brothers and sisters beyond the work they do. Indifference, in fact, does not look to the future; it does not care about the future of creation, it does not care about the dignity of the stranger and the future of children. In this context, I am delighted that here in Abu Dhabi last November the first Forum of the Interreligious Alliance for Safer Communities took place, whose theme was child dignity in the digital world. This event recalled a message issued a year before in Rome during an international congress on the same theme, a congress to which I had given my complete support and encouragement. I thank, therefore, all the leaders who are engaged in this field, and I assure them of my support, solidarity and participation and that of the Catholic Church, in this very important cause of the protection of minors in all its forms. Here, in the desert, a way of fruitful development has been opened which, beginning from the creation of jobs, offers hope to many persons from a variety of nations, cultures, and beliefs. Among them, many Christians too, whose presence in the region dates back centuries, have found opportunities and made a significant contribution to the growth and well-being of the country. In addition to professional skills, they bring you the genuineness of their faith. The respect and tolerance they encounter, as well as the necessary places of worship where they pray, allow them a spiritual maturity which then benefits society as a whole. I encourage you to continue on this path, so that those who either live here or are passing through may preserve not only the image of the great works erected in the desert but also the image of a nation that includes and embraces all. Human fraternity requires of us, as representatives of the world’s religions, the duty to reject every nuance of approval from the word “war”. Let us return it to its miserable crudeness. Its fateful consequences are before our eyes. I am thinking in particular of Yemen, Syria, Iraq, and Libya. Together, as brothers and sisters in the one human family willed by God, let us commit ourselves against the logic of armed power, against the monetization of relations, the arming of borders, the raising of walls, the gagging of the poor; let us oppose all this with the sweet power of prayer and daily commitment to dialogue. Our being together today is a message of trust, an encouragement to all people of good will, so that they may not surrender to the floods of violence and the desertification of altruism. God is with those who seek peace. From heaven, he blesses every step which, on this path, is accomplished on earth. Benedict XVI, Address to the New Ambassadors to the Holy See, 16 December 2010. Message for the Celebration of the World Day of Peace, 1 January 2015, 2. Second Vatican Ecumenical Council, Declaration on the Relation of the Church to Non-Christian Religions Nostra Aetate, 5. Cf. Address to Participants at the International Conference for Peace, Al-Azhar Conference Centre, Cairo, 28 April 2017. F. M. Dostoyevsky, The Brothers Karamazov, II, 2. Interreligious General Audience, 28 October 2015.